The iPad is a small tablet computer made by Apple Inc. Apple first showed it on 27 January 2010. It is larger than a smartphone and smaller than a laptop computer. It has a multiple touch interface (use two or more fingers to do certain things). It is different than a laptop in that it doesn't have a keyboard. Instead, it has a "virtual keyboards" using the touch screen, and a physical keyboard can be added. It doesn't have Adobe Flash. This keeps it from crashing, but some websites will not display correctly. Also you cannot have multiple windows open at the same time and drag and drop things between them. Apple made an early version of a tablet computer in 1993 called the Newton MessagePad. It had similar functions to the iPhone, iPod Touch and iPad except it didn't have advanced things like the internet or a voice program. Apple stopped making Newtons in 1998. Apple re-entered the mobile device market in 2007 when the iPhone was released. Some of the iPhone's features are based on the Newton. By the end of 2009 rumors about the iPad had been around for several years, and on January 27, 2010 Steve Jobs announced the iPad. It was not the first tablet to be sold, but it was the first one to sell in large numbers. It also was the first one that was controlled almost entirely by fingers touching the screen. Many of the earlier tablets (and PDAs, or personal digital assistants) used a lot of buttons or a stylus to control the tablet. The first generation iPad was able to be bought in the United States in April 2010 and most of the rest of the world within several months. Apple announced the iPad 2 on March 2, 2011 and it was released on March 11, 2011. It had a new sleeker design and had a front and back video camera. It was also a lot thinner and had curved edges because people were complaining that the first gen iPad made their hands sore. On March 16, 2012 Apple released the iPad 3. It kept the iPad 2's design but was slightly thicker and was the first iPad to have a retina screen for a sharper picture. It has 50% more pixels than a standard HDTV screen. On November 2, 2012, Apple released the iPad 4 which featured an A6 processor, a new connector called Lightning which replaces the old 30 pin dock connector, and an updated FaceTime camera. They also released a new iPad called the iPad Mini which featured a 7.9 inch screen instead of the normal 9.7 inch screen, though it didn't have a retina display. On October 22, 2013, the new iPad Air was announced which looked like the iPad Mini but still had the full size screen. It also had the newer A7 processor that the iPhone 5s had. At the same time, a new version of the iPad mini was announced that had the better Retina display. On October 16, 2014, the iPad Air 2 was announced along with the iPad Mini 3. The iPad Air 2 has a thinner design than the iPad Air and has new features, such as a better camera and a Touch ID fingerprint reader. The iPad Mini 3 has the same design as the iPad Mini 2, but has a better camera and also has the Touch ID fingerprint reader that the iPad Air 2 has. On September 9, 2015, Apple announced a new version of the iPad, the iPad Pro. It comes with either a 12.9 inch and a 9.7 inch screen and the A9X processor. Apple made a hardware keyboard that plugs into its side, and a stylus pen, the Apple Pencil, that can be used to draw on the screen as if it was a piece of paper. On October 30, 2018, Apple announced the new update to their iPad Pro line. 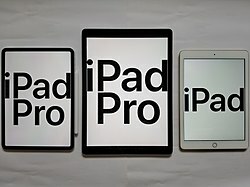 The update showcased the thinnest iPad ever, at 5.7mm thin, an improved processor, dubbed the A12x processor, a larger screen, and FaceID support. The screen uses Apple's all new liquid LED technology, first seen in the 2018 released iPhone XR. The new iPad Pro's also came with a slew of accessories, including a brand new Smart Keyboard, Apple Pencil, and multiple cases. Apple also changed the charging system from their long used Lighting connector, for a USB-C charger. Apple's new iPad Pro line come in two sizes. ↑ 1.0 1.1 1.2 1.3 1.4 "iPad – Technical specifications and accessories for iPad". Apple Inc. January 27, 2010. Retrieved January 27, 2010. ↑ Crothers, Brooke (January 27, 2010). "Inside the iPad: Apple's new 'A4' chip". CNET. CBS Interactive. Retrieved January 27, 2010. ↑ Djuric, Miroslav (April 3, 2010). "iPad Wi-Fi Teardown". Ifixit.com. p. 2. Retrieved April 17, 2010. ↑ "iPad 2 Wi-Fi Teardown". iFixit. Retrieved March 12, 2011. ↑ Murphy, Samantha (February 5, 2013). "Apple's 128GB iPad Now on Sale". Mashable. Retrieved March 6, 2013. ↑ Djuric, Miroslav (April 3, 2010). "Apple A4 Teardown". iFixit. Retrieved April 17, 2010. ↑ "Apple iPad 2 GPU Performance Explored PowerVR SGX543MP2 Benchmarked". Anandtech. Retrieved March 12, 2011. ↑ "iPad Mini review". CNet. Retrieved 23 February 2014. This page was last changed on 17 February 2019, at 18:19.